By Matt Hinch. Let's get something out of the way before we get into it here. If you look at the tags on Slaves B.C. 's latest, Lo, and I Am Burning you'll notice one is “christian”. Looking at the song titles should make that obvious as well. Let's get something out of the way before we get into it here. If you look at the tags on Slaves BC's latest, Lo, and I Am Burning you'll notice one is “christian”. Looking at the song titles should make that obvious as well. But fear not, fellow unbelievers. You can barely understand what they're saying anyway. In a good way. Besides, there's some pretty dark stuff in the Bible too. As long as you like fearsome black metal hybridized with a handful of other genres, philosophy shouldn't be an issue. I probably shouldn't even have brought it up. I was just a little surprised is all. Even though I have a vinyl copy of their previous LP. A telling example of their style hits you like a sledgehammer right away. Opener “Lo” is a flurry of black metal struck with a little discord. The vocals are positively shiver-inducing. You'll find a sludgy bit and you'll get pounded by some death metal. I'd hesitate to call it a formula but it's fairly indicative of what unravels throughout the album. No matter where you find yourself within the nine tracks you can be sure to be consumed by darkness. Both the foundational elements of black and death metal strengthen this feeling. The black metal comes at you fast and tremulous incorporating atmosphere when needed and launching you into icy, windswept flight elsewhere. The death metal veers to the left of old school. It's got that edge of weird that seems to be all the rage right now, but they keep it within the range of normal comprehension while emphasizing an ominous nature. On tracks like “We Are” and “XLV” the pace slows in places as the mood thickens. Pounding chugs more akin to deathly doom and hypnotic repetition move into dangerous sounding places where paranoia grows. There's even a groovy sway guiding you to sink into despair but rise back up, lifted by off-kilter discord and black metal fury. Case in point; “Unclean”. The listener fights a doomy slog until cresting the peak and rumbling down the slope on an avalanche of anguish then continuing through the valley and across the plains while storm clouds gather to facilitate annihilation. 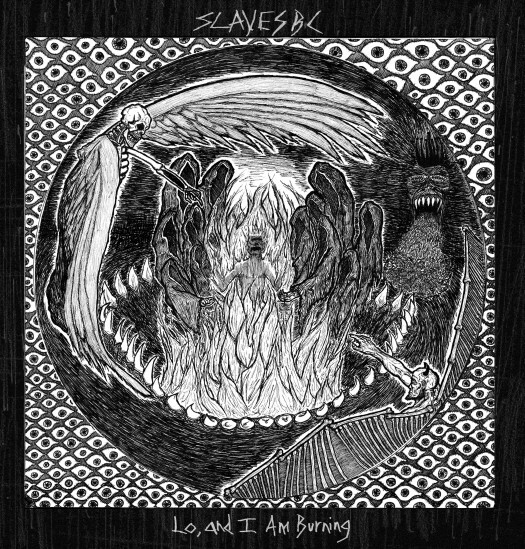 Slaves B.C. 's greatest asset is their ability to stitch together a multitude of styles and feelings into something seamless that makes you feel uncomfortable on a sliding scale yet constantly yearning to feel it harder. More pain! More darkness! More catharsis! All the while coarse, feral, vampiric screams twist your vertebrae as you're driven to throw your body headlong into the maelstrom. Lo, and I Am Burning is a raucous steamroller of energy creating and releasing tension deep within. It's dynamic and noisy, frightening yet alluring. If you're looking for release, look no further than the cleansing fires Slaves B.C. have set ablaze. Amen. Pretty grueling stuff. some of the song titles don't reflect a very...orthodox...approach to Christianity, though?